To learn about the topography and soil of Preston, one has only to stand near the top of Preston Hill. There, a vista of lowland Hertfordshire appears - one can see for miles. Preston is 143 metres (470 feet) above sea level. 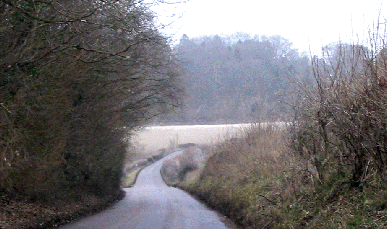 At 153 metres, Tring (the highest point in Hertfordshire), is only ten metres higher than Preston. If one glances straight ahead from Preston Hill, the woods of King’s Hill Plantation can be seen at the bottom of the hill. The strata which forms the landscape is clearly visible and can also be seen on a photograph of Preston taken almost 100 years ago. Below a capping layer of clay and flint, there is the white outcrop of Chiltern chalk. To the casual observer, the field beside the lane at Preston Hill seems to be comprised almost entirely of flint and stones, large stones, with a redeeming skim of clay. In the distance, the clay appears whitened and softened by the flint and stones. The sheer number of stones would seem to make the onerous nineteenth century task of picking them entirely superfluous. Yet the fields are fertile and, helped by a relatively dry and warm climate, the land is suitable for growing crops. All needs could be satisfied locally and even if there was not a specialist midwife or coffin maker on hand, an experienced local woman (such as my great x2 grandmother, Susan Currell) could be called upon at births and the carpenter made coffins. Farm labourers were hired for a year at Statute or Hiring Fairs held on Michaelmas Day, 29 September. These were labour markets where the farmers’ job vacancies were matched with available workers. In 1833, my great x2 grandfather, Joseph Currell ‘let himself to Mr George Roberts at Kings Walden Lodge ‘til the Michaelmas’. The labourers arrived at the fairs dressed in their ‘Sunday best’ clothes and listened to the gossip about the merits of their prospective employers. When a hire agreement was reached it was sealed with the ‘hiring shilling’ and then the fun began, the music rang out, the beer flowed and a good time was had by all. All that remained was to pile their possessions precariously onto horse-drawn carts - their table and chairs, bed and boxes, pots an kettles - and head for the ‘Promised Land’. The hiring fairs were gradually replaced by newspaper advertising and Registry Offices from 1850 but the fairs, such as the one held on Preston Green, continued as eagerly awaited attractions. The four or five weeks of harvest in late summer was the peak time in the farming calendar. Men toiled from dawn to dusk. Woman bound sheaves together. Children abandoned school to make bands of straw and carry their father’s meals to the fields. There was a scene of bustle and rhythmic activity as scythes were swung. It was hot and hard. Faces tanned the colour of mahogany. The midday rest was ‘nature’s blessing’ with a meal of bread, cheese or bacon and beer or tea and an earned rest in the shadows of a hedgerow. The busiest time was the carrying of sheaves as loaded farm wagons passed and re-passed on the road between the fields and the stack yard. Horses drawing empty wagons galloped back to the fields like two-year- olds - not a moment to be lost. Wisps of stray straw hung on the hedges. Gate posts were demolished in the frantic rush. Small wonder at the rejoicing when the harvest was complete. When the wheat had been gathered, women asked the farmer for permission to glean stray ears. The women and children (even babies and a parade of prams) gathered in the field. Then the stubble was scrutinized for errant ears of wheat. These were gathered, taken home, threshed and bread was baked from the flour. My aunt, who was born in 1908, recalls her legs being scratched by stalks while she gleaned - a world apart from shopping for bread at Tesco. Farm labourers were earning nine shillings a week (45p) in 1830. By 1860, weekly wages were 11-12s (55-60p) and by the end of the century they had risen to 13-14s. Compare this with the wages of unskilled labourers in towns or the income of the skilled tradesman living in the village who might earn around twice this amount. One can understand why young people drifted into towns. The factor that made village life relatively tolerable was the supplementary wage of wives and children from straw plaiting. Another system of payment was also used when work was rewarded with a lump sum when an agreed assignment was completed. An example was that a fixed amount of say £10 might be paid (in 1890 -1900) when the harvest was finished. This method of payment was used to encourage extra effort when working “against the clock”. Enough could be earned in a month to pay the rent for a year and still have change. This was used to buy essential items like boots and clothing. Some of my family recall heading for ‘Stiddies’ in Hitchin (as Hawkins store was known) to spend their ‘harvest money’. Low wages drastically limited the diet of the farm labourer. A study in 1820 concluded that men lived on bread, potatoes with some salt and little else (remember we are in arable territory here) and drank water. However, I believe that this diet is understated. Preston had three inns at this time. One presumes that they might well have been frequented. There was also the potential of produce from gardens and the allotments which were at Preston from at least 1873 and the ‘food for free’ in the hedgerows - the berries, fruits and nuts. If my father’s family is typical, the cook pot also contained the occasional poached rabbit or pheasant (poached being the method of acquisition, not of cooking). My great grandmother even roasted small birds and a system of catching these called ‘clap trapping’ (which involved putting nets over hedges) is recalled by one of my cousins. In 1864 the labourer’s typical diet included a little meat, butter or dripping and some rice and sugar. Tea seems to have gradually become an attainable luxury about this time. The Preston village shop at the turn of the century was decorated with advertisements for Lyons and Brooke Bond Tea. The kitchen table bore monotonous fare lacking fruit and yet better than forty years earlier. It has been calculated that this daily diet would have provided 2760 kcals, 70 grams of protein, 54 grams of fat and a little calcium and iron with few vitamins. A labourer doing heavy farm work would need a daily intake of 3-4,000 kcals, children - 2,700-3,000 kcals and women doing light work, 2,700 kcals. The shortfall is obvious. So, we have working men with an inadequate diet and constant exposure to the elements - a potentially fatal combination. But many lived a long life. Probably, they didn’t or rather, couldn’t, exert themselves strenuously. They would have little energy to spare for sport, poaching or trouble making and their extreme weariness due to a permanently inadequate diet and mind numbing and repetitive labour would result in a docile and passive population. Hardly a recipe for complaint and revolution. Preston, like other Hertfordshire villages, was a community of farm workers with a supporting cast of tradesmen which made the village virtually self-sufficient. In 1891 there was Thomas Sharp, the butcher; Amos Smith, the carpenter; Daniel Smith, the grocer; John Brown, the wheelwright; Frederick Robinson, the tailor; Joseph Peters, the boot-maker; Frank Warren, the baker and Hannah Frost and Margaret Robinson, the dressmakers. With such an comprehensive array of imported talent, mainly centered around Preston Green, there was no reason for anyone to ever venture outside the village. It is easy to dismiss agricultural workers as the proverbial ‘Hodge’ - a rather dim specimen of humanity, the product of centuries of village inbreeding who is often presented as giving the vaguest of rambling, erroneous directions to passers-by. After studying their work, the feature that stands out is their versatility and skill. 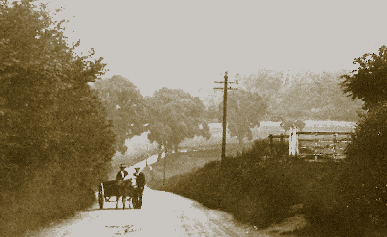 Through the year, they dug ditches, ploughed, set seeds, hoed, weeded, mowed, laid hedges, cut chaff, spread dung, threshed and harvested, felled timber, cut faggots of wood and maintained roads. The more specialized workers - cowmen, shepherds, hurdle makers and horsemen - had even greater expertise which was reflected by their wages. Their work was seasonal. There were the busy times such as hay-making and weed control in late spring and harvesting during five weeks in August and September. But at other times, work was scarce - dreary ditch-digging and hedge laying, cutting faggots of firewood and felling timber during winter. Ploughing was a regular activity. Those caring for livestock (the horse keepers and cowmen) were continuously occupied but even shepherds had hectic and slack periods. Some said that ‘labouring is the hardest graft as a man can have. When yo’re used to it yo’ don’t feel it much. But it’s mostly work and bed, work and bed, and bein’ out in all sorts o’ weather...It takes years before yo’ can be what yo’ may call a first class man’. Today, the fields surrounding Preston are open with little protective hedging and few stone walls. In the nineteenth century, the fields were smaller and surrounded by bushy, hand laid hedges made by labourers like my self-employed hurdle making grandfather - “ ‘e laid ‘edges lovely”. Elms dominated the hedgerows. In summer, the crops were weedy because of the absence of herbicides. Those fields not used for crops were lush, attractive flower meadows with which today’s conservationists would have a ‘field day’. Although flocks of sheep grazed in the area - my great x2 grandfather was a shepherd at Kings Walden Hall in Hitchin parish - farming was mainly arable. A rotation system was often followed - fields were left fallow, followed by a sowing of barley (for the malt trade), then clover and a main crop of wheat sown in the spring. Oats or a root crop such as turnips might also be grown. Regular ploughing suppressed the annual weeds. The 1870s saw an agricultural depression in Hertfordshire following a run of poor summers. Agriculture was also affected by the increasing importation of cheaper grain and meat which drove down prices. Preston was affected by this slump. When Pond Farm, Charlton Road was sold in 1884, a note was made that, ‘in consequence of the depressed state of agriculture’ it had the ‘very low rent of £78 pa. previous to which it was let for £105 pa.’. 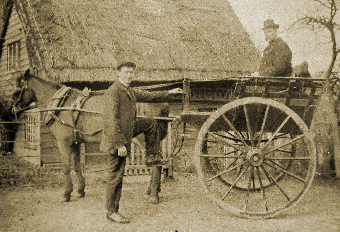 Another sign of the state of farming in the 1880s is that one of the touted selling points of Pond Farm was not its agricultural potential but that, ‘it is well calculated for a Hunting Box being within easy reach of the Hertfordshire and Puckeridge fox hounds’. This was following a trend established during the sale of Temple Dinsley in 1873 when rather than promoting its farms, the opportunity for field sports such as the hunting and shooting of foxes, pheasants and partridges, rabbits and hares was highlighted: ‘It is in a favourable hunting district...the sporting capabilities are of a high character and afford excellent partridge and pheasant shooting’. The constant battle with the weather was an inescapable part of daily life from the drip, drip, drip of steady rain to the sapping slog against the winds that skimmed the Chilterns: from winter’s numbing cold to the unrelenting heat of high summer. Just one elemental foe would be gruelling, but there might easily be combinations of pitiless conditions: howling, icy winds; showers and searing sun; horizontal hail and so on. The inexorable ticking of time was a further pressure on farm workers. Seed must be sown by a certain time and in favourable conditions. The harvest had to be collected, stacked and thatched before the weather broke. Work could only be done during the daylight hours. A farmer said, ‘I don’t begrudge you men the food but I do grudge you the time to eat it’. Striving to meet harvest deadlines could cause death. Men fell from wagon loads and hayricks. Hastily driven wagons crushed the unwary against gate posts. Pitchforks and scythes could be lethal tools in tired, yet hurried hands. Sunstroke and disease from slaking thirst by drinking contaminated ditch water were also potential causes of fatalities. Other work for the more robust women (that also seduced children from Preston School) was stone picking. Bottomless, wooden frames measuring a cubit yard were placed around the field. Into these receptacles, stones were piled. The pickers were rewarded with 6d (2 ½ p), roughened hands and a stiff back. When full, the frame was lifted and positioned in another spot. The collected stones were carted off and used to make and repair the roads. After a rainfall, these stones filtered the water into one of many small ponds by the roadside shown on large scaled maps of Preston. The collected water was considered to be pure enough to drink.